Sometimes, through no fault of their own, theatres are so indelibly linked with a traumatic experience that all plays there become tarred by association. Three years ago I sat in a sweltering black box theatre above the Rose and Crown and watched WAG: The Musical – a show so terrible it effectively caused me to avoid my local Walthamstow-based theatre ever since. During that time All Star Productions have continued to develop their reputation as purveyors of solid fringe productions of near forgotten musicals. Having seen a production of Howard Goodall’s Girlfriends that showed the limitations of the venue alongside the strength of the performances, the team had rather fallen off my radar during to the horror of the singing footballers’ wives. However whispers across the blogging sphere in the intervening years had led me to believe All Star Productions had been going from strength to strength, and earlier this year they scored a West End transfer when Superman: The Musical made it to the Leicester Square theatre. So when an unexpected, but wholly welcomed, invitation to accompany View From The Gods to the depths of E17 to watch an Irving Berlin & Moss Hart musical that I had not previously heard of, Civilian Theatre finally felt it was time to seek closure on the past. All Star Productions should be lauded for their dedication for restaging the unknown and the forgotten. I would imagine it is a rather canny financial position as well – one would think the staging rights to an Irving Berlin musical not performed for 70 years are rather less than for Anything Goes. It also doesn’t come weighted with expectation and if it proves to be a success then you may find yourself – well if not Cameron Mackintosh rich – then at least as rich as Croesus. 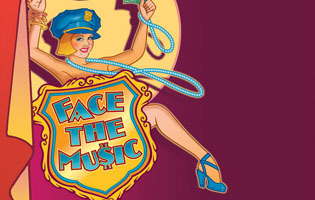 Face The Music has the distinction of being the first collaboration between Berlin & Hart and is the first professional UK staging of the show. These facts make the show worthy of interest but are certainly not enough to praise it. And the potential downside of All Star Productions dedication is obvious – there may well be good reasons why a musical has sat on the shelf for 70 years. While it may lack the absolute belters that can be found in the best works of both Berlin & Hart, there are still some lovely tunes in here. If You Believe closes the first half and is a thumping, toe-tapping cod-evangelical feel that musical devotees will find has distinct echoes of Blow, Gabriel, Blow, that wonderful number which kicks-off the second half of Anything Goes. Equally songs like Let’s Have Another Cup of Coffee, My Beautiful Rhinestone Cowboy and Manhattan Madness are not ground-breaking numbers but they do tend to be quite delightful (or given who we are talking about, possibly it is in fact de-lovely). Certainly the strength of the production does not lie in the plot, which is frankly bonkers and incomprehensible even by the standards of a musical revue. I am yet to fathom exactly why the investors wanted to lose money and then, when they were, suddenly they were desperate to turn a profit. And the ending! The ending enters reaches an absurdist level where the brain turns to jelly. Somehow a trial is turned into a complete musical revue and I can no longer work out if I watching a show, a show of a trial, or a trial within a show. It doesn’t really matter. It all ends happily. Of course it does! Really what makes this production a success is the ambition, charm and skill of the cast and crew. 14 performers (plus 3 musicians) fill the small stage, and yet within this show full-cast numbers have been choreographed into the action. We get miniature waltzes, 4-piece male comic dance numbers and tap-dance routes in close-up. This is as intimate as it gets and it is a chance for audience members to, quite literally on occasions, feel the sweat of the performance and the rush of air as a sweeping leg passes inches from the face. It could have been a disaster. Shuffling, tight, nervous dance numbers as performers jostle for the room. Nothing could be further from the truth and Sally Brooks should take great pride in the choreography on display. Numbers are tight and recognise the limitations of the space. There is also thoughtful use of props, and the handcuffed dance number in Torch Song is fit for any stage and showcases both the dancing ability of Joanne Clifton (a World and European Professional Ballroom Dancing Champion) and the comedic talents of James Houlbrook (whose malleable facial expressions manage to steal a number of scenes from under the noses of the leads). There are impressive performances across the board but Laurel Dougall (previously seen in The Grand Tour at the Finborough – clearly getting used to work on the micro-scale musical) stands out as Myrtle Meshbesher, whilst Joanna Hughes is a charming lead and seamlessly fits the coy but adventurous archetype so beloved of 1930’s shows. So clear direction, superlative choreography and a talented cast have meant that Civilian Theatre has avoided several years of psychotherapy and found a far cheaper way of working through my issues with the theatre at the Ye Older Rose and Crown. Good work All Star Productions, and roll on the next show. Well it was deserved – even if Myrtle does get to walk off with all the best lines! (I couldn’t believe the grotto/ghetto joke – it is so unexpectedly tasteless that I think it slips through without the audience even noticing) Good luck with the rest of the run. I do agree on all of the above! 🙂 Thanks again!